Ever since Morgan was born people have asked how do I have the time... and energy... to cook as much as I do? Well, 1) I love to cook. 2) I started cooking before I entered kindergarden so I'm kinda used to it. 3) Providing my family with home-cooked food (packed with nutrients) rather than processed food (packed with additives) is for me, a top priority, so I find a way to fit it into my day. For me, it's all about moderation and balance. Do I have days when I just don't feel like cooking? Absolutely! Sometimes even a few days in a row. So we order out or I open a can of ravioli for Morgan. (I like Annie's for prepackaged organic meals and Ella's Kitchen for organic on the go snacks). Do I feel bad? Absolutely not, because I know the majority of the time my family is getting healthy, home cooked meals. AND I know that if I hold myself to unrealtistic standards with no room for rest, I will burn out...and probably not be very fun to be around. I recently watched a very compelling documentary on Netflix, Forks Over Knives, that argues that eating a plant based and whole foods diet and eliminating all animal products from our diet can reverse several serious health problems such as obsesity, diabetes, heart disease, and cancer. Now as a girl who loves her steak well marbled and mediums rare, I'm not ready to hop on the vegetarian bandwagon, but I do believe in the benefits of limiting the amount of meat and processed foods we eat on a daily basis. Let's get started! Making your own hummus is simple, cheap, and very healthy. 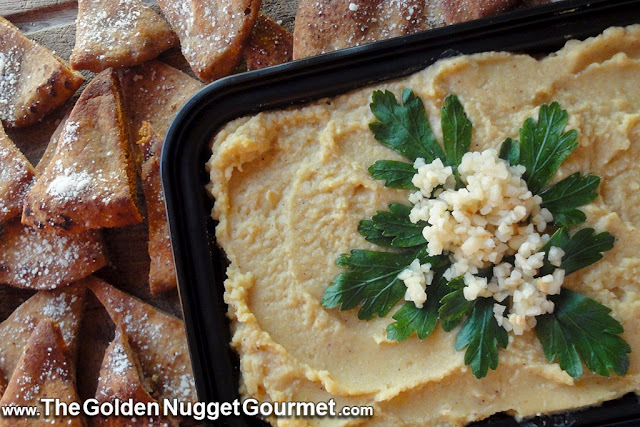 Here is a great hummus recipe to get you started and then you can experiment with different seasonings to create a variety of options. Don't forget the homemade pita chips!